A tourist takes a picture of an Inukshuk above the Tablelands Trail in Gros Morne National Park in Newfoundland Labrador. 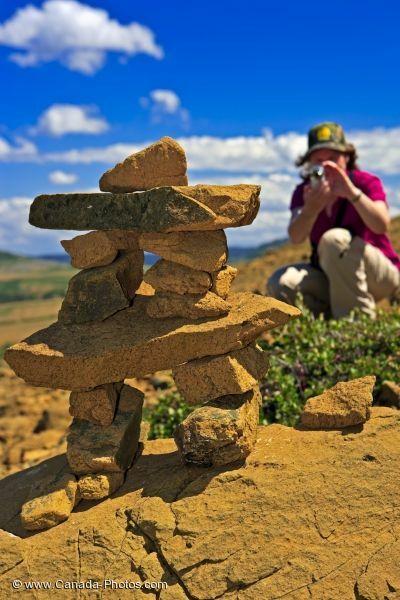 After climbing a steep hill above the Tablelands Trail in Gros Morne National Park in Western Newfoundland, a woman takes a picture of an Inukshuk. Throughout the Tablelands, there may be a few of these rock formations which were once used as directional markers for travellers. Tourist photographing an inuksuk from a steep hill above the Tablelands Trail in Tablelands, Gros Morne National Park, UNESCO World Heritage Site, Highway 431, Viking Trail, Trails to the Vikings, Northern Peninsula, Great Northern Peninsula, Newfoundland Labrador, Newfoundland, Canada. Model Released. Picture of a woman taking a photo of an Inukshuk above the Tablelands Trail in Newfoundland.